Aims: The aim of this study is to analyze the clinical features and prognosis of cancer patients with venous thromboembolism (VTE). Subjects and Methods: This was a retrospective observational study that selected cancer patients with a new VTE event from January 2003 to 2013 using the hospital information system in Beijing Hospital. The patients were divided into three groups according to the site of thrombosis as follows: pulmonary thromboembolism (PTE), deep venous thrombosis (DVT), or PTE plus DVT. The clinical manifestations and prognosis among the three groups were compared. Results: Among the 18,531 patients diagnosed with a malignant tumor, 280 (1.51%) patients presented with VTE at first diagnosis or during the disease course; of these, 26 had incidental pulmonary embolism (IPE). Dyspnea was the most common symptom in the PTE group (51.65%), and lower limb swelling was found mostly in the DVT group (65.27%). Approximately 53.92% and 63.21% of patients had VTE events within the first 3 and 6 months after cancer diagnosis, respectively. The median survival time of all VTE patients was 24.0 ± 7.85 months, with the DVT group having the longest survival time among the three groups (P < 0.05). About 29.23% of the 130 patient deaths occurred within the first 30 days after VTE diagnosis, and 46.92% occurred within the first 3 months. Conclusions: The incidence of IPE in cancer patients was not rare. Most VTE events occurred within the first 6 months after the cancer diagnosis, and nearly half of the deaths occurred within the first 3 months of VTE diagnosis in cancer patients. Venous thromboembolism (VTE) is closely related to malignant tumors. The incidence of VTE in tumor patients is reported to be 4%–20%. Complications of anticoagulant therapy in tumor patients is higher than that in the general population. More importantly, VTE is the second leading cause of death in cancer patients.,, Unfortunately, VTE's severity remains underestimated by many oncologists. This study retrospectively analyzed the clinical data of cancer patients with VTE and aimed to explore the clinical characteristics and prognosis and probably improve the prevention and prognosis of patients with malignant tumors concomitant with VTE. This was a retrospective, observational study including patients diagnosed with cancer and/or VTE during the period of January 2003–2013 using the hospital information system (HIS) in Beijing Hospital, which provides data for all hospitalizations, including diagnosis and procedures. Patients with a new VTE event and diagnosis of cancer were screened and analyzed in this study, excluding patients with isolated cancer or isolated VTE. Ethical approval was obtained from the ethics committee of Beijing Hospital, China. Written informed consent was provided by all patients or their family members. Patients' medical information on VTE and cancer were collected from HIS or medical record system. VTE-related information included symptoms, signs, auxiliary examination results, treatments, risk assessment of VTE, and pulmonary thromboembolism severity index. Cancer-related information included the time of diagnosis, staging, and treatments. The survival information was obtained from the medical record system, outpatient follow-up, or telephone follow-up. Follow-up was terminated in the event of patient death. The deadline for follow-up was December 2014, and the median survival time was then calculated. Survival time was defined as the time from diagnosis until death or truncation. Truncation events included patients who were either lost to follow-up or still alive at the time of study termination. VTE diagnosis was confirmed by objective medical imaging methods. The diagnosis and risk classification of PTE are based on the European Society of Cardiology, the Guide of Diagnosis and Treatment of Acute Pulmonary Embolism in 2014. The diagnosis of deep venous thrombosis (DVT) is based on the treatment of DVT on the 9th edition of the American College of Chest Physicians. The TNM staging standard of malignant tumors is based on the 2007 edition of the American Joint Committee on Cancer guide. In addition to the overall evaluation of tumor-related VTE, patients were divided into three groups based on the site of the thrombosis as follows: PTE group, combined positron emission tomography (PET) and DVT group, and DVT group. Clinical features and prognosis were compared among the three groups. Statistical analysis was performed using SPSS version 17.0 software (SPSS Inc., Chicago, IL, USA). Chi-square test was used to compare the clinical characteristics of the study groups. Kaplan–Meier method was used to draw survival curve, and the Log-rank test was made to compare the corresponding curve. The value of P < 0.05 was considered statistically significant. From January 2003 to 2013, a total of 1402 patients with VTE and 18,531 patients with a malignant tumor were admitted to our hospital at the same time. A total of 280 patients were diagnosed with VTE at the time of or after the diagnosis of cancer, accounting for 19.97% (280/1402) of patients with VTE during that period. No patients had experienced VTE event before cancer diagnosis in this study. Among the 280 patients, 157 were male and 123 were female cancer patients with VTE (median age: 66.60 ± 12.60 years). Among the 280 patients, 41 had isolated PTE (14.64% of the cancer-associated VTE), 189 had isolated DVT (67.50%), and 50 had PTE with DVT (17.86%). The incidence of VTE in cancer patients was 1.51% (280/18531) in 10 years (2003–2013); among these, the incidence of isolated PTE, isolated DVT, and combined PTE and DVT in cancer patients was 0.22%, 1.02%, and 0.27%, respectively. A majority of VTE events occurred shortly after the diagnosis of cancer. Among the cancer patients, 53.92% had their VTE event within the first 3 months, 63.21% within the first 6 months, and 68.93% within the first 9 months [Table 1]. The symptoms, signs, and scores of tumor-associated VTE are shown in [Table 2] and [Table 3]. Among the 91 patients with PTE, 65 (71.42%) were symptomatic (suspected pulmonary embolism,); of these 65 patients, 60 were diagnosed with the computed tomography pulmonary angiography (CTPA) and five with ventilation/perfusion scan. The remaining 26 patients (9.29%) were accidentally diagnosed during a regular contrast-enhanced computed tomography (CECT) of the chest while assessing the curative effect (incidental pulmonary embolism, [IPE]); of these 26 patients, 15 had lung cancer and 11 had digestive tract tumors. Common sites of the embolus were the lower lobes of the bilateral lung pulmonary artery and its branches. A total of 239 (85.36%) patients received pharmacologic or mechanical thromboprophylaxis for VTE, and 41 (14.64%) were not anticoagulated regarding a low platelet count, hemoptysis, or gastrointestinal bleeding. Among the 239 patients who received thrombolysis and anticoagulation therapy, 24 (10.04%) showed complications with hemorrhage, including gastrointestinal bleeding (n = 14), hematuria (n = 3), respiratory tract hemorrhage (n = 4), and skin bleeding (n = 3). Severe hemorrhage (gastrointestinal bleeding) occurred in two patients, and blood transfusion was required. One patient had a history of peptic ulcer, while the other did not; none of the two patients have a digestive tract tumor. At the end of the follow-up (December 2014), 130 cancer patients with VTE died (23 in the isolated PTE group, 29 in the combined PTE and DVT group, and 78 in the isolated DVT group), whereas 105 survived, and 45 were lost to follow-up. A majority of the patients died of progression of underlying cancer (n = 87, 66.92%). Among the noncancer-related deaths, PTE was the leading contributor (n = 18, 13.85%), followed by infection (n = 13, 10.00%), cardiac insufficiency (n = 5, 3.85%), and other reasons (n = 7, 5.38%). Among the 130 patients who died, 29.23%, 46.92%, 69.23%, 80.77%, and 83.08% died within 30 days, 3, 6, 9, and 12 months after diagnosis of VTE, respectively [Table 4]. No statistically significant difference was observed among the three groups according to the time of death (P = 0.963). The survival curves during the entire follow-up period for the three groups were different. Kaplan–Meier survival analysis showed that the median survival time of patients with tumor-related VTE was 24.0 ± 7.85 months, and the survival rate at 1-, 2-, and 3-year follow-up after the diagnosis of VTE was 61.43%, 56.78%, and 55.35%, respectively [Figure 1]. The median survival time of patients with isolated PTE was 16.0 ± 10.50 months; combined PET and DVT, 6.0 ± 1.99 months, and isolated DVT, 42.0 ± 9.52 months. The Log-rank test showed significant differences among the three groups [P = 0.015; [Figure 2]. No statistically significant difference was observed between the isolated PTE group and combined PTE and DVT group, as well as between isolated PTE group and isolated DVT group with respect to median survival time, with P = 0.382 and 0.150, respectively. 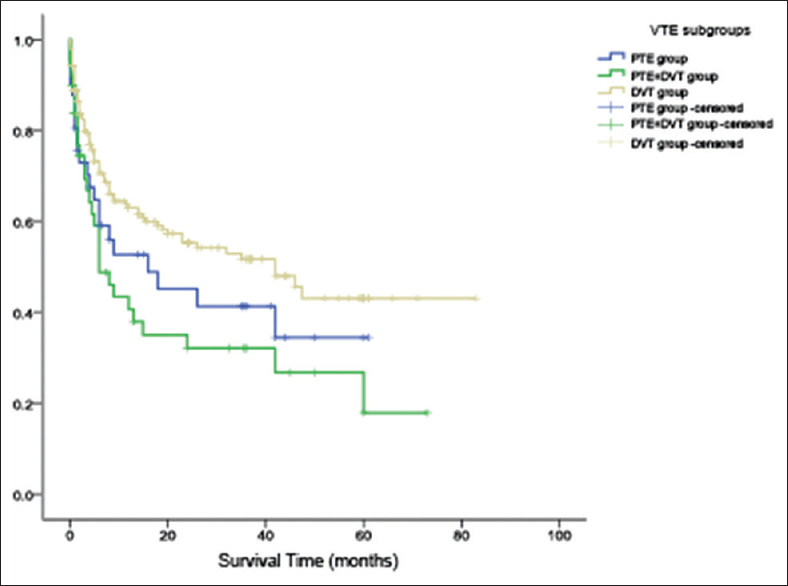 The median survival time was significantly different between combined PTE and DVT group and isolated DVT group (P = 0.005). The risk of VTE significantly increased during the first 6 months after the diagnosis of cancer; however, the risk of VTE in patients who underwent chemotherapy and/or surgery was also significantly increased., This research showed that VTE risk rapidly increased in the first 3 months after cancer diagnosis, accounting for more than half of all VTE events. As time progressed, the increase in VTE risk gradually slows down. Cancer-associated VTE may be caused by the hypercoagulable state, direct effects of therapies on the vascular endothelium, or bedridden after the operations. As a result, cancer patients with potential VTE risk should be properly monitored, especially during the first 3 months after the diagnosis of cancer. Activation of coagulation promotes tumor growth and angiogenesis, leading further credence to the association of the clinical hypercoagulable state and worse prognosis, and prophylactic anticoagulation therapy in patients with cancer can significantly reduce thrombotic events; however, the conclusions on the risk of bleeding are still different.,, Bleeding in cancer patients occurs through the complex interplay of disease-and treatment-related factors. For example, chemotherapy often leads to thrombocytopenia, and the tumor itself can also cause abnormal clotting mechanism, which therefore leads to an increased risk of bleeding in patients with cancer who received anticoagulant therapy making drug prevention for cancer patients with VTE difficult. In this retrospective study, the overall bleeding incidence rate was 10.04%, with the major bleeding events rate of 0.84%, which were lower than that of the previous studies. This may be because the patients enrolled in this study received treatments other than chemotherapy. Only 13.93% of patients took measures to prevent VTE, and the proportion of patients who took prophylactic pharmacologic anticoagulation was even lower, which may result in an insufficient understanding of the risk of VTE in cancer patients; however, the concern about anticoagulation was more important. The concerns about the risk of bleeding also lead to low compliance with prophylaxis in the cancer population. Our data failed to answer the question of whether cancer patients with VTE should receive more aggressive anticoagulation than other patients with thrombosis. Mortality was significantly and consistently higher among patients who developed VTE as compared to those who did not. 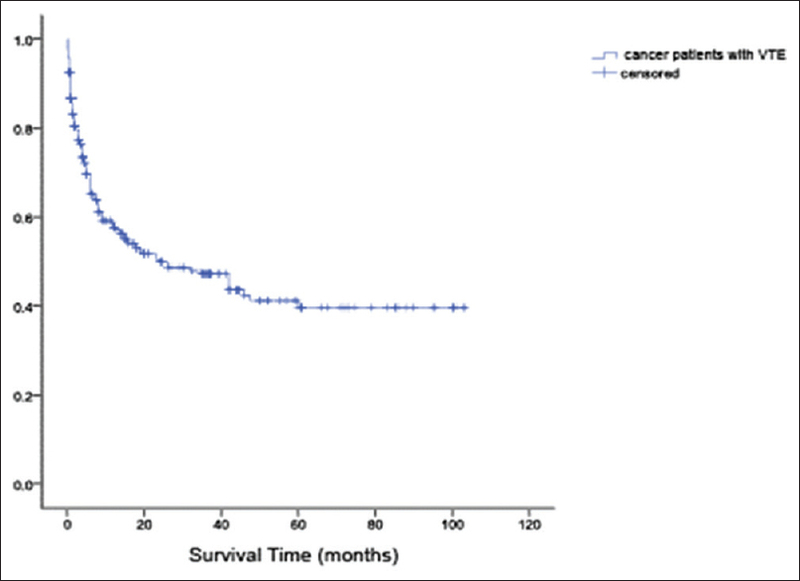 In this study, we could not compare the survival time between patients with or without cancer. The results indicated that the risk of death rapidly increased in the first 3 months after the diagnosis of VTE, especially in the 1st month. After that, as time progresses, the risk of death slowly decreased. Almost one-third of the deaths occurred within the 1st month, half of the deaths occurred within the first 3 months, and 69.23% of deaths occurred within the first 6 months after the diagnosis of VTE. The median survival time of the combined PTE and DVT group is shorter than the isolated DVT group. The two leading causes were tumor itself and PTE, which is consistent with those of the previous studies. The symptoms of tumor-related VTE were associated with thrombosis location. The most frequent symptoms of PTE were dyspnea (47/91, 51.65%) and syncope (10/91, 10.98%). The most frequent symptoms observed in patients with DVT were limb swelling (156/239, 65.27%) and pain (99/239, 41.42%). The occurrence of a cough, dyspnea, chest pain, heart palpitations, and syncope was higher in combined PET and DVT group than the isolated DVT group, and limb swelling was more common in the combined PET and DVT group than the isolated PTE group. Therefore, cancer patients with VTE who showed these symptoms should not only be attributed to the primary tumor. 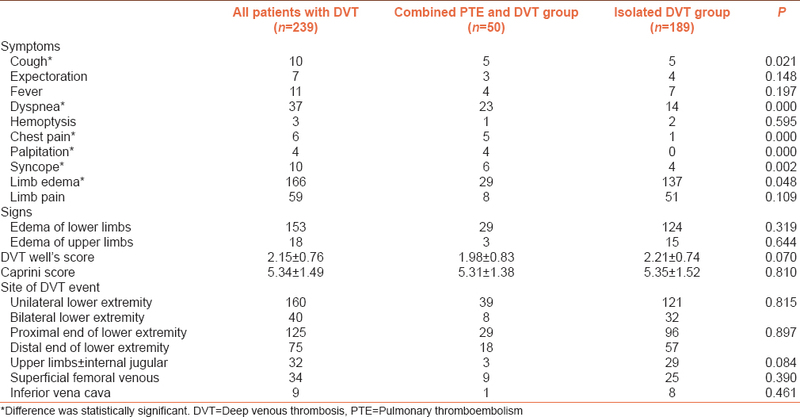 Among the 239 patients with DVT, only 50 of them were also diagnosed as PTE, probably because of insufficient recognition of VTE in early cases. Some patients with DVT did not undergo CTPA, which would have resulted in lower incidence of PTE. In the recent years, this situation is gradually reduced with the deepening understanding of VTE. In addition, the occurrence rate of thrombus in the upper extremity, internal jugular vein, and subclavian vein was high, which were related to vascular endothelial injury and slow blood flow caused by the deep venous indwelling catheter, local tumor, or regional lymphadenopathy. It should be noted that some patients with PTE were diagnosed when they underwent a regular chest CECT examination, which is called IPE, with the occurrence rate of 1.5%–3.4%,, whereas the occurrence rate of IPE in cancer patients is 4.4%.,, A total of 26 patients in this study were accidentally diagnosed with PTE, accounting for 9.29% of the cancer-related VTE, which was much higher than that of the previous studies. One possible reason was that patients were asymptomatic or symptoms of PTE were atypical and were covered by the primary disease symptoms. Patients with advanced diseases often suffered from dyspnea due to tumor progression, merger pleural effusion, or lung infection, which is difficult to distinguish from PTE symptoms. In addition, concomitant diseases in elderly patients should also be considered. Undiscovered VTE may be the cause of sudden death or deteriorating condition in cancer patients. This study retrospectively analyzed the characteristics of cancer-associated VTE in the past 10 years. No patient was diagnosed with VTE before the detection of cancer, which was large because few patients with VET were followed for surveillance or extensive screening for occult cancers. Lack of awareness on the association between cancer and VTE might also be an important factor. Although a small randomized clinical trial found that more occult cancers were detected at an early stage with extensive screening, which theoretically could improve cancer treatment potential, no difference in the survival was noted between this strategy and the usual care. Opinions still differ regarding screening for an underlying occult cancer after an idiopathic VTE event. Symptoms of tumor-related VTE were associated with thrombosis location. IPE in cancer patients was not rare. More than half of the VTE event in cancer patients occurred within the first 3 months after the diagnosis of tumor, and nearly half of the deaths happened within the first 3 months of VTE diagnosis. The assessment and monitoring of VTE in cancer patients should be strengthened and necessary preventive measures should be taken after weighing the pros and cons. This work was supported by the National Key R&D Program of China (2016YFC0902003). Mandala M, Clerici M, Corradino I, Vitalini C, Colombini S, Torri V, et al. Incidence, risk factors and clinical implications of venous thromboembolism in cancer patients treated within the context of phase I studies: The 'SENDO experience'. Ann Oncol 2012;23:1416-21. Prandoni P, Lensing AW, Piccioli A, Bernardi E, Simioni P, Girolami B, et al. Recurrent venous thromboembolism and bleeding complications during anticoagulant treatment in patients with cancer and venous thrombosis. Blood 2002;100:3484-8. Sørensen HT, Mellemkjaer L, Olsen JH, Baron JA. Prognosis of cancers associated with venous thromboembolism. N Engl J Med 2000;343:1846-50. Khorana AA, Francis CW, Culakova E, Kuderer NM, Lyman GH. Thromboembolism is a leading cause of death in cancer patients receiving outpatient chemotherapy. J Thromb Haemost 2007;5:632-4. Khorana AA. Venous thromboembolism and prognosis in cancer. Thromb Res 2010;125:490-3. Konstantinides SV, Torbicki A, Agnelli G, Danchin N, Fitzmaurice D, Galiè N, et al. 2014 ESC guidelines on the diagnosis and management of acute pulmonary embolism. Eur Heart J 2014;35:3033-69. Bates SM, Jaeschke R, Stevens SM, Goodacre S, Wells PS, Stevenson MD, et al. Diagnosis of DVT: Antithrombotic therapy and prevention of thrombosis, 9th ed: American college of chest physicians evidence-based clinical practice guidelines. Chest 2012;141:e351S-418S. Prandoni P, Piccioli A, Girolami A. Cancer and venous thromboembolism: An overview. Haematologica 1999;84:437-45. Nordström M, Lindblad B, Anderson H, Bergqvist D, Kjellström T. Deep venous thrombosis and occult malignancy: An epidemiological study. BMJ 1994;308:891-4. Prandoni P, Lensing AW, Büller HR, Cogo A, Prins MH, Cattelan AM, et al. Deep-vein thrombosis and the incidence of subsequent symptomatic cancer. N Engl J Med 1992;327:1128-33. Heit JA, Silverstein MD, Mohr DN, Petterson TM, O'Fallon WM, Melton LJ 3rd, et al. Risk factors for deep vein thrombosis and pulmonary embolism: A population-based case-control study. Arch Intern Med 2000;160:809-15. Heit JA, O'Fallon WM, Petterson TM, Lohse CM, Silverstein MD, Mohr DN, et al. Relative impact of risk factors for deep vein thrombosis and pulmonary embolism: A population-based study. Arch Intern Med 2002;162:1245-8. Levitan N, Dowlati A, Remick SC, Tahsildar HI, Sivinski LD, Beyth R, et al. Rates of initial and recurrent thromboembolic disease among patients with malignancy versus those without malignancy. Risk analysis using medicare claims data. Medicine (Baltimore) 1999;78:285-91. Sallah S, Wan JY, Nguyen NP. Venous thrombosis in patients with solid tumors: Determination of frequency and characteristics. Thromb Haemost 2002;87:575-9. Khorana AA, Francis CW, Culakova E, Fisher RI, Kuderer NM, Lyman GH, et al. Thromboembolism in hospitalized neutropenic cancer patients. J Clin Oncol 2006;24:484-90. Stein PD, Beemath A, Meyers FA, Skaf E, Sanchez J, Olson RE, et al. Incidence of venous thromboembolism in patients hospitalized with cancer. Am J Med 2006;119:60-8. Khorana AA, Dalal M, Lin J, Connolly GC. Incidence and predictors of venous thromboembolism (VTE) among ambulatory high-risk cancer patients undergoing chemotherapy in the United States. Cancer 2013;119:648-55. Amer MH. Cancer-associated thrombosis: Clinical presentation and survival. Cancer Manag Res 2013;5:165-78. Falanga A, Russo L. Epidemiology, risk and outcomes of venous thromboembolism in cancer. Hamostaseologie 2012;32:115-25. Trinh VQ, Karakiewicz PI, Sammon J, Sun M, Sukumar S, Gervais MK, et al. Venous thromboembolism after major cancer surgery: Temporal trends and patterns of care. JAMA Surg 2014;149:43-9. Agnelli G, Gussoni G, Bianchini C, Verso M, Mandalà M, Cavanna L, et al. Nadroparin for the prevention of thromboembolic events in ambulatory patients with metastatic or locally advanced solid cancer receiving chemotherapy: A randomised, placebo-controlled, double-blind study. Lancet Oncol 2009;10:943-9. Liu ZL, Wang Q, Wang M, Wang B, Huang LN. Low molecular weight heparin in treating patients with lung cancer received chemotherapy: A meta-analysis. J Cancer Res Ther 2018;14:S437-43. Yu Y, Lv Q, Zhang B, Lan F, Dai Y. Adjuvant therapy with heparin in patients with lung cancer without indication for anticoagulants: A systematic review of the literature with meta-analysis. J Cancer Res Ther 2016;12:37-42. Chew HK, Wun T, Harvey D, Zhou H, White RH. Incidence of venous thromboembolism and its effect on survival among patients with common cancers. Arch Intern Med 2006;166:458-64. Storto ML, Di Credico A, Guido F, Larici AR, Bonomo L. Incidental detection of pulmonary emboli on routine MDCT of the chest. AJR Am J Roentgenol 2005;184:264-7. Gosselin MV, Rubin GD, Leung AN, Huang J, Rizk NW. Unsuspected pulmonary embolism: Prospective detection on routine helical CT scans. Radiology 1998;208:209-15. Browne AM, Cronin CG, English C, NiMhuircheartaigh J, Murphy JM, Bruzzi JF, et al. Unsuspected pulmonary emboli in oncology patients undergoing routine computed tomography imaging. J Thorac Oncol 2010;5:798-803. Cronin CG, Lohan DG, Keane M, Roche C, Murphy JM. Prevalence and significance of asymptomatic venous thromboembolic disease found on oncologic staging CT. AJR Am J Roentgenol 2007;189:162-70. Douma RA, Kok MG, Verberne LM, Kamphuisen PW, Büller HR. Incidental venous thromboembolism in cancer patients: Prevalence and consequence. Thromb Res 2010;125:e306-9. Piccioli A, Lensing AW, Prins MH, Falanga A, Scannapieco GL, Ieran M, et al. Extensive screening for occult malignant disease in idiopathic venous thromboembolism: A prospective randomized clinical trial. J Thromb Haemost 2004;2:884-9.